To create the sauce, mix the yogurt, marmalade and cilantro together. Keep refrigerated so the sauce is well chilled when served. In a skillet over medium-heat, fry the tuna balls evenly in oil until they have begun to brown. When ready, remove and place over paper towels to absorb any excess oil. Serve with the prepared yogurt sauce. These tuna balls can be made a few hours in advance and cooked later when ready. Today I would like to share with you a recipe that’s easy to prepare and ideal for almost any situation, from family get-togethers to school lunchboxes. This is one of my mother’s classic recipes when we were kids–she would prepare this snack when we arrived home, tired and hungry from school. The best part about this recipe is that even the kids can lend a hand in the preparation and have a fun time in the kitchen. 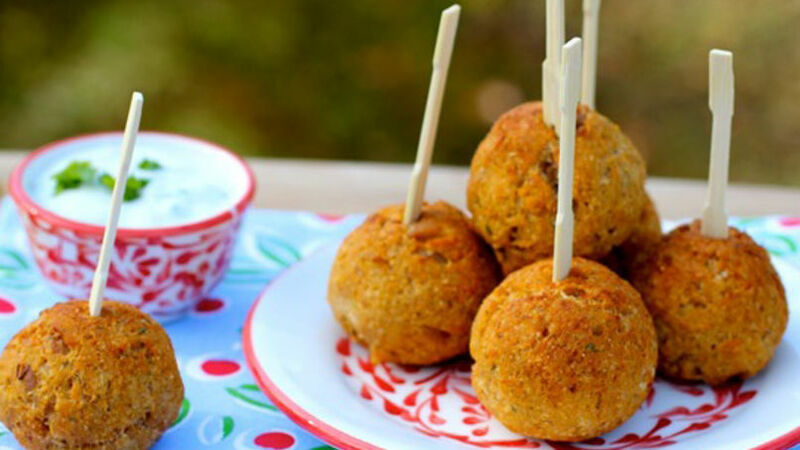 My children especially love the crunchy outside texture and soft center of these tuna balls. This appetizer or snack can easily be paired with hummus, tomato, guacamole and yogurt-based sauces as you prefer. Try surprising your own children with this delicioso creation as a side dish, light meal or lunchbox treat; they’ll love it!